The world of technology is expanding rapidly and there are now a whole host of gadgets that are available for those tech geek dog owners too. Even if you are not a collector of all the latest gadgets there are some extremely practical and useful products out there that could really benefit both you and your dog. Most of the tech-related dog products do come with a higher price tag though so it is always important to read the reviews, consider why you need it and make sure that it is appropriate for you and your dog’s needs. We have pulled together a list of some doggy related gadgets that we think can really add value. Have you had the neighbours complaining about your dog’s barking when you are out? Does your dog seem distressed when you return home after being gone for a few hours? Do you frequently come home to damage done by your dog when they are left unsupervised? Do you have a new puppy or rescue dog that you want to keep an eye on when you first leave them alone? Maybe you have just introduced a new dog to your household and you want to make sure that they are getting on fine with another dog/s or other pets in the household when you are out? Or, perhaps, you just want to check in on your dog throughout the day, maybe it lifts your mood seeing them snuggled contently on the sofa and makes your day at work more bearable. If you fall into any of these categories then the Furbo Dog Camera could be for you. If your dog does have severe separation anxiety or is behaving very destructively or barking a lot then the Furbo a solution to the problem. You will need to implement a behaviour modification programme, you may need to get the help and guidance of a qualified dog behaviourist and you may need to look at providing your dog with more mental and physical enrichment. See our detailed article for more guidance on how to deal with separation anxiety. The camera, however, can be a good tool to let you monitor your dog’s behaviour and see what a trigger may be. Perhaps your dog only barks when he sees certain things passing the window. You could work on a training programme to teach him he doesn’t need to bark at them or you could employ some management techniques, like blocking his view. If your dog is suffering from separation anxiety, the camera can give you a better idea of how severe it is and how detailed a behaviour modification plan you may need. Perhaps your dog only becomes distressed if you leave them longer than two hours, for example. Or if they start pacing, whining and scratching immediately and they don’t ever settle, you know that you have a bigger project on your hands and the help of a behaviourist may be beneficial. The Furbo does also allow you to speak to them and, for some dogs with only mild levels of anxiety, maybe this would be enough to comfort them. 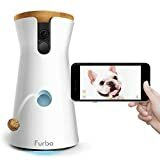 The Furbo Camera will not only allow you to monitor your dog’s behaviour but, because it lets you interact with them too, and they have a treat dispensing variety, there is a chance that it could be a possible tool that you can use to help work towards removing their separation anxiety. The camera has a whole heap of really useful functions. It is tuned to alert you to movement from your dog, so you will know when they are active and not sleeping. It is set to alert you to when your dog is barking so this can help you to work out what a trigger might be for this. It can also be set to toss a treat at certain intervals during the day and, there is a two-way audio function. If your dog is barking and you ask them to be quiet via the Furbo, if they do this and remain quiet you can reward them by dispensing a treat. If you do want to do more than just monitor your dog then you do have to pay a monthly subscription fee for these app features and there are some people that have complained about glitches with the app but the Furbo is still widely regarded as one of the best and most popular doggy cameras on the market. There are a number of other pet cameras available, some with more functions and better reviews than others. If you want to do a bit of comparison research, some of the other popular brands include the Pet Cube, the Petzi Treat Cam (less expensive but not quite as well-reviewed) or for a basic, well reviewed option for those on a budget, the Kamtron Camera could be a good choice. This one really is just to allow you to monitor your dog though. Whilst these can be an expensive investment they are often well worth it and the techy features really do often serve a functional purpose, rather than just being a cool gadget. Okay, so we will start with a caveat about using an Automatic Feeder. They are more frequently used for cats as it is more acceptable for them to be left for occasional longer periods without company. Using an automatic feeder for your dog is not a license to leave them for extended long periods. Apart from the fact that your dog needs to go potty, they are sociable animals that need company and stimulation. Even when leaving them for short periods, if they do not suffer from separation anxiety, it is still important that they get plenty of exercise, company and enrichment. Having said all that, there are times when an automatic feeder can be extremely useful. If you have a dog with a medical condition that requires them to have frequent small meals at regular intervals this can be a helpful tool as the food is measured out and can be set to be dispensed at certain times. It means you won’t forget a meal and, if you are out for a few hours without them and they need one of their meals, they are not going to miss it. Some dogs with chronic pancreatitis or acid reflux need small meals more often to help manage the conditions. Maybe you want to enjoy a long lie at the weekend but your dog is used to getting their meal at a certain time and will pester you until they get it. The feeder should allow you to lounge in bed whilst it dispenses your dog’s first meal of the day. They can be a great tool if your dog is overweight and you are managing a weight loss programme for them. By feeding them small and often, you can sometimes trick them into feeling more full and you will also ensure that they get the exact measurement of food that they should. It saves any human errors or extra feeds or mismeasurement. Maybe you normally feed your dog at a particular time and they have got into that routine and will expect dinner at a certain time but you have to work a different shift for a few days and you want to keep their feeding schedule the same. These types of feeders are only going to work if you feed dry kibble. They won’t dispense wet food and it would be a hygiene issue and a bacteria haven with raw food, even if it could dispense it! Automatic feeders usually don’t work for the biggest breeds either as they only hold a certain amount of food. They are a much better option than the free flow feeders that have become popular recently. Not only can these encourage obesity and digestion issues as the dog is essentially free feeding but, they can also allow the food that is sitting in it to become stale or even infested with insects. There are a lot of automatic feeders on the market, with a range of budgets and different features. Make sure you select one that is appropriate for the size of your dog, so it holds enough to feed them for the duration you need it to, and that it can be set on a timer and to dispense the exact amount you want it to. 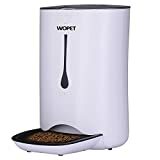 The WOpet Automatic Feeder receives generally good reviews, it holds up to 7 litres of food and it will dispense at set times and you can even record a message to signify that it is mealtime for your dog. GPS tracking devices for dogs are becoming increasingly popular. They usually attach to your dog’s collar and once you install an app on your phone you can then track your dog’s activity. If your dog has a terrible recall then a tracker is not a solution. You are putting your dog at risk just letting them run free without being able to get them back easily. It is also bad etiquette and often dangerous if they will not come back around other dogs (especially around on leash dogs that are fearful of other dogs), other people or with livestock. Make sure that you have worked on training a reliable recall before you start to let your dog off leash. Even dogs with a reliable recall can occasionally find themselves in situations that might mean that they get lost or separated from their owner and for those times, a GPS tracking device can prove to be extremely helpful and could possibly save your dog from an unnecessary trip to the pound or even from having a potentially fatal accident. If you are out on a walk and there is unexpected an extremely loud bang this could cause your dog to bolt and then get lost. Fireworks are a big culprit. Whilst we would always recommend walking your dog in daylight hours during seasons when fireworks are likely, sometimes you can be caught out unexpectedly. If you are in an unfamiliar area and your dog picks up a scent trail, for example, they may then get disorientated and struggle to find their way back to you. Whilst we would recommend keeping a dog with a high prey drive on leash in any environment where there is a high chance of coming across wildlife (for the safety of the other animal and your own dog), even the most well-behaved dog can sometimes find the lure of the chase too much. Even if it only happens the one time, having a tracker can be reassuring. If you are a professional dog walker, a tracker can give you peace of mind and it can also be useful to let your clients see what their dog has been up to on their walk with you. If you have a new rescue dog and they are particularly fearful, whilst you may never have them off leash and will always be taking precautions to keep them safe, they may bolt out of an opened door, manage to dig or jump their way out of a seemingly secure garden or even slip out of a collar or harness. A tracker will offer you greater peace of mind, even if there is only a small chance of them getting loose. Being able to track your dog’s activity level and the ground they cover, even when they do have a perfect recall can be very interesting. Some trackers also provide data that could help if you are working on a weight loss programme or monitoring your dog’s fitness levels. One of the most well-reviewed trackers on the market is the Whistle 3 GPS Pet Tracker & Activity Monitor. It is one of the more expensive options and you also need to subscribe to their paid monthly subscription service but it has a very good reputation for its reliability and many functions, including activity tracking and setting fitness goals. The Tractive is another popular choice. 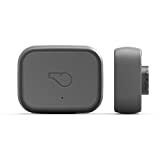 It is considerably less expensive than the Whistle but it does not have as many functions and it is not quite as well reviewed in terms of its reliability and connectivity. Do you have a dog that adores playing fetch with a ball? Are they super smart? Do you have a really rubbish throw, have mobility issues or want to keep your dog entertained in the garden whilst you try to get on with some weeding? This could be the gadget for you both. Interactive ball throwers will only be a worthwhile investment if you know your dog is super ball motivated. They are expensive and, if your dog is not so fussed about fetch then it could be money down the drain. Just like with normal ball launchers, it is also something that you would have to limit the use of. 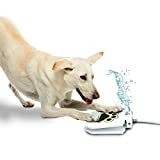 If your dog becomes too obsessed with it they can actually cause themselves injury by the repetitive strain of the high energy and high impact activity.. If they already have mobility issues, are a growing puppy, or are outdoors in hot weather then it is not a good choice. Used sparingly and in the right circumstances though it can be a mentally enriching and fun activity for your dog and it can be a great distraction technique if you are trying to get on with other tasks. Don’t leave your dog alone with it though and always watch out for them getting too over-aroused or obsessed. Trying to get your dog to settle after being over-aroused for too long can be difficult as the adrenalin in their system will cause the release of cortisol and it can leave them in a heightened state of stress and unable to fully relax. Our article on why ball throwers are not always a good thing will give you more useful information on the cons of a ball throwing game like this. Some dogs will learn how to activate the ball launcher themselves very quickly but others may need a bit of extra guidance from you to help them to understand how it works. One of the most popular and well known interactive ball throwers is the iFetch. It isn’t cheap but it scores better than most for reliability, functions and throwing ability. You can adjust the distance that it throws so that it works well for the garden space it is used in. The iFetch Too is the bigger version which uses standard tennis balls and is better for larger breeds. The balls that come with the launcher are not of great quality and users often recommend going with some Air Kong Squeaker Tennis Balls instead. They are more durable and their surface is not abrasive and won’t wear down the teeth. Make sure you select the right size ball for the size of the launcher you have. Do you already have a GoPro? Have you always thought about getting one? They are a tiny, very portable, really robust camera and high quality, smooth video recorder in one. They can be used underwater (with a waterproof housing), are easy to attach to your body for filming high adrenaline activities or from an interesting perspective and they work well in the rain and snow. If you really do love your gadgets and are always taking videos and photos of your dog and you are both off out on great adventures together, then the GoPro along with the harness that fits on your dog to use it with – the GoPro Fetch- could be a great purchase. The GoPro itself is not a cheap piece of equipment but, if you know that you will use it, not just when it is on your dog, then it will likely be a worthwhile investment as it is well reviewed. If you want to use it to video your dog’s adventures from their perspective then that is when you have to purchase the GoPro Fetch as this is a harness that has a fixture to hold the GoPro securely and safely on your dog’s back. Because it is bulkier than a normal harness you may need to spend some time getting your dog comfortable with wearing it. Lots of yummy treats and short sessions initially is a good idea. It is often used to film from the dog’s perspective when out on a hike, whilst they are performing in a dog sport, when they are swimming (if the GoPro is in the waterproof housing) or even when they are just out for a run in the park. Do you have a long haired large breed dog that sheds bucket loads of hair every day? Do you already have a Dyson Hoover? The Dyson Groom fitting could be a game changer for you! Yes, you can use a de-shedding tool like a Furminator but the hairs do still escape all over the room if the grooming is done inside. It can also be pretty labour intensive. The Dyson Groom attachment allows you to groom your dog and have the hairs then be sucked straight into the vacuum cleaner. There are a few caveats with this product though. It will only fit certain models of Dyson Hoover (and even some other brands too). Double check before you go ahead and purchase. It is not suitable for short haired moulting breeds. It doesn’t suction up the short hairs well enough and some reviewers also feel the slicker brush bristles are too harsh for a thinner, shorter coat. And, the biggest con is that it is attached to a noisy hoover which will be too scary and stressful for some dogs. Only go for this product if you know your dog is not at all phased by the hoover. Even though the Dyson hoovers are quieter than a lot of models, it can still be too much for many dogs. You can work on helping desensitise your dog to a hoover but it may still be too much to expect them to be groomed with it! For more help with finding a recommended vacuum cleaner for dog hair and for further guidance for helping a dog that is fearful of them, see our article about good hoovers for a hairy dog household. Does your dog love soaking themselves in water? Are they happy drinking out of a hose? Is your garden a bit of a suntrap? You may want to consider trying a pet water sprinkler which the dog can be taught to activate themselves by stepping on the pedal. The Trio Gato’s Outdoor Dog Pet Water Sprinkler is one of the better reviewed of these types of products. Whilst they can be great for helping to keep your dog cool, hydrated and mentally enriched it is very important that your dog is always supervised when the sprinkler is on. If they are constantly drinking from it or snapping at the flow of water instead of using it just now and then or using it to just soak themselves, then it is probably not such a great idea. Water intoxication is a real issue and, if your dog consumes too much water too fast it can even be potentially fatal. An Ultraviolet Urine Detector is one of those gadgets that you might be surprised even exists. You might initially be derisive about it and wonder why you even need it. You might not really need it but it is one of those items that you can kind of become obsessed with using. Even if you don’t use it for practical reasons it can become a very fun novelty party item when you are visiting guests! On a serious note, if you have a puppy or new rescue dog going through toilet training, a male dog that is prone to leg cocking in the house or a dog that has developed incontinence issues this could be a genuinely practical product for helping with home hygiene. Sometimes, if an accident has occurred through the night, whilst you have been out or when you have left your dog unsupervised it can be difficult to see exactly where the puddle is, especially if you have dark carpets, and you may not realise it has happened. If you don’t clean it up, not only is this unhygienic but, your dog will be more likely to go back to that same spot again. 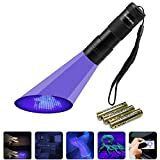 By running this ultraviolet torch over the area quickly, it will show up any stains as a fluorescent patch so that you can then zone in your cleaning. It can also be useful if your dog occasionally vomits. This can be common if they suffer from acid reflux. You may think you have cleaned up the vomit but, if you then run the light over the patch, if there are any remnants these will show up so that you know to give it a further thorough going over with the cleaning agent you are using. Don’t forget to also buy an effective and doggy safe stain and odor remover, ideally one that is enzymatic. Or you could try the often recommended home remedy of one part water to one part white vinegar. Pour it over the affected area and leave for ten minutes before dabbing up with paper towels. Then sprinkle lightly with baking soda, which absorbs the moisture, and leave this for fifteen minutes before hoovering it up. Do you have a dog that suffers from separation anxiety? Or, maybe, you have a dog that can become easily over-aroused and excitable? The very compact iCalmDog Portable Speaker comes pre-loaded with 4 hours of music that has been specially designed to promote a calming effect in your dog. It is important to be realistic with a product like this. It will never be a quick fix, cure-all and, if your dog has extreme separation anxiety it is likely to have no impact at all. In those situations, a programme of behaviour modification will be required, often with the guidance of a qualified behaviourist. This speaker will more likely be useful if the separation anxiety is only mild and when it is being used in conjunction with other things like enriching and safe treat toys. Some people believe that it helps their dogs to get a more settled night sleep and that it can help if they have mild anxiety when in the car. There are a number of vet clinics that play the music in their waiting areas. So, if you want to try to promote a more relaxed environment for your dog, it certainly can’t hurt. It is not a cheap investment though and often people will have unrealistic expectations. 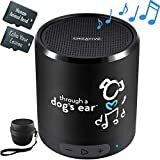 Make sure that, if you purchase it, you are aware that it may turn out that it only becomes an expensive Bluetooth speaker for playing your own music through if you do not feel it makes any difference for your dog. The Wickedbone is a SUPER expensive toy and it is also very new to the market so reviews are in their early stages but, if you are a major tech lover then it could send you into overdrive. 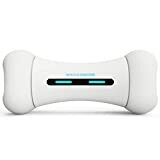 You can control the movement of the bone through your phone if you want to encourage your dog to chase it in a particular direction or make it move in a way that you know your dog likes. It can also be set to interactive mode where it responds directly to your dog’s movements. So, if your dog is chasing it, it knows to turn around and move away from them. You can even control the speed and how quickly it can accelerate. Whilst it is reasonably tough, it is not designed to be a chew toy and for aggressive chewers or unsupervised play, given the price tag, this would not be recommended. Some dogs can actually be a little freaked out by the movement of the toy too so, for nervous dogs it may not be the best choice. In short, if you really love gadgets, want a unique gift for a doggy loving friend or you are a bit lazy with how much you are happy to engage directly in play with your dog then this could be a worth a try. Otherwise, there are a lot more robust interactive toys out there that are not nearly so expensive.